If you wear partial or full dentures and cannot remember the last time you saw your dentist for an adjustment, it may only be a matter of time before the dreaded teeth in the apple occurs. Worse yet, you could be biting into a delicious dinner only to discover that your dentures have been left behind. Thankfully, there is a solution and it may not be a replacement for your partial or full dentures. 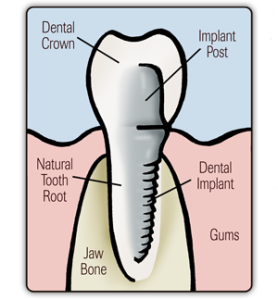 Dental Implants are quickly replacing cumbersome and uncomfortable dentures and once in place, are just as strong as natural teeth. The biggest differences between implants and dentures is that false teeth can be removed. Dentures consist of lower and upper dental plates that fit over the gums and are usually held in place with dental adhesive. The adhesive actually helps provide a barrier between the plates and the natural gums to avoid irritation. Most people who wear dentures usually take them out before bedtime to clean. Dental implants are imbedded into your gums and are a permanent solution when replacing a missing tooth or multiple teeth. Because implants function just like your real teeth, there’s no additional need for messy dental adhesive. Most people believe that dental implants are much more expensive than dentures, but the cost differential between implants and a good fitting pair of dentures is not that great, especially when you consider that dentures need to be replaced every few years due to fluctuations in weight and age. An implant can last for the rest of your life. When Gosta Larsson had his dental implants surgically placed in 1965, they were still functioning when he passed away in 2006. Mr. Larsson was the first person to have dental implants and his lasted for forty years. Dental implants have come a long way since Mr. Larsson and can last forever if you practice good oral hygiene. If you would like to more information, schedule an appointment with Dr. Emery to determine if you are a good candidate for dental implants, the only permanent solution for missing teeth.